According to Boris Johnson, "Russia has not been so hostile to the UK or to western interests since the end of the Cold War"
LONDON, December 17. /TASS/. The UK’s Foreign Secretary Boris Johnson prior to a visit to Moscow, due in a few days, compared Russia with closed, nasty ancient Sparta, though stressed it necessary to cooperate with Russia. "I was reading Thucydides’ history of the Peloponnesian war. It was obvious to me that Athens and its democracy, its openness, its culture and civilisation was the analogue of the United States and the West," he said in an interview with The Sunday Times. "Russia for me was closed, nasty, militaristic and antidemocratic - like Sparta." "There was an extraordinary moment of hope and change when the [Berlin] wall came down and suddenly everything felt very different," he continued. "It now feels as if that was a total illusion." "Russia has not been so hostile to the UK or to western interests since the end of the Cold War," he said. The foreign secretary spoke about the events in Crimea back in 2014 as an example of such hostility, and claimed Moscow’s "destabilizing activities" in the Balkans. He called the current state of relations with Russia a tragedy, "recalling the times when his childhood mistrust of Moscow morphed into a belief, at the end of the Cold war that relations might improve, the newspaper writes. "When I was a kid, Russia was a very scary proposition. The idea of friendship with Russia seemed to be absurd because Russia was threatening us with nuclear warheads," Boris Johnson said. "Johnson is looking for opportunities to work with the Russians," The Sunday Times writes. He continued, "pointing out that he shares their [Russians] ancestry - his mother is the granddaughter of a Russian-Jewish palaeographer and he is named after a Russian ·migr·. "I took the precaution before I became foreign secretary to station my antecedents across the world," he told the newspaper. 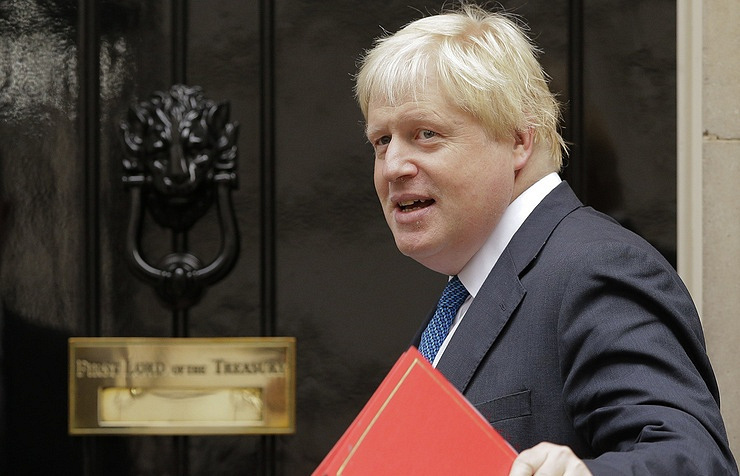 Officially, a date of Boris Johnson’s visit to Russia is not announced, but the newspaper says the foreign secretary would fly to Moscow on Thursday, December 21. On December 13, Russian Foreign Ministry’s spokeswoman Maria Zakharova said: "We believe that it is necessary to unfreeze all the major cooperation mechanisms, as well as to resume relations between various agencies in full. We plan to discuss thoroughly the possibilities to carry out this work with the British foreign secretary." Johnson planned to visit Russia in April 2017 but suspended the visit following the chemical weapons incident in Syria’s Khan Shaykhun. In September, Zakharova made a Facebook post commenting on Russian Foreign Minister Sergey Lavrov’s meeting with his British counterpart, which took place on the sidelines of the United Nations General Assembly. She said that Lavrov had confirmed the invitation for Johnson to visit Russia. In early October, the British Foreign Office said that the visit would take place at the end of the year.